A few months ago I wrote an article about the “control points” simulation mode and how it could be used to produce reliable simulation results provided that certain precautions are taken into account. 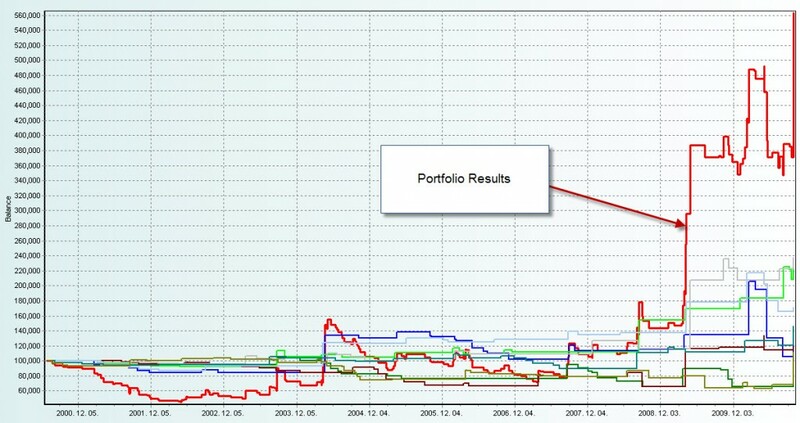 After experimenting a lot with this simulation technique it became obvious to me that it is extremely valuable for the study of simple trading techniques along a wide variety of pairs and setups, allowing us to get a lot of information about a given system without the need to perform very time consuming “every-tick” simulations. After the end results are obtained the final “more accurate” simulations are carried out, revealing that – provided that adequate precautions are taken into account – the control points method is accurate for long term simulations. Today I am going to talk about the idea of exploring simple systems using the “control points” methodology and how this greatly speeds up the system creation process of very simple strategies. Certainly one of the main goals of Asirikuy is to develop systems that are very robust – like Quimichi or Ayotl – working through a very wide variety of instruments under extremely varied market conditions without any changes in settings. The creation of such systems is interesting not only because it gives us more certainty that the systems will survive long term changes in market conditions but because they allow us to diversify our portfolios across many different instruments. However one of the main obstacle in evaluating such strategies is the fact that test runs have to be made on many different currency pairs, making the development process effectively slow and cumbersome since MT4 does not allow the simultaneous testing of a system on several pairs at the same time. For this reason it becomes important to develop methods to allow for faster and accurate simulations on MT4 so that we can speed up the development of such strategies and quickly evaluate ideas to see if they might work or not. The control point method allow us to perform such simulations on the daily time frame easily and effectively, without the need for any lower time frame data provided that certain precautions (mentioned on the previous article I wrote on the control points method) are taken into account. Bear in mind that it is VITAL to take into account all these precautions as the neglect of even a single one can cause the system’s simulations to be totally worthless as they will exploit some limitations of the control points simulations methodology. To show you the power of this method I decided to test a modified version of Watukushay No.1 to test a simple MA cross strategy on a variety of different currency pairs using the control points method. I did an initial optimization on the GBP/USD of the MA cross periods followed by a test of the same parameters on 8 different currency pairs including three JPY containing pairs. These whole optimization and running process took less than 15 minutes. The results on the portfolio and individual pair results are shown below. Note that the final equity curves shown were obtained with the “every tick” method, exactly matching those of the control points simulations due to the fact that adequate precautions were taken. Although the overall results of the trading tactic are not impressive the strategy does achieve the goal of bringing overall profitable results while running on many different symbols with the exact same parameters. It is also very important to say here that the above process took less than 15 minutes and allowed me to get a lot of insight into daily moving average cross strategies, making it easier to improve future attempts to arrive at better and more robust portfolio techniques. Although the scope of control points simulations is reduced due to the overall limitations imposed by the necessary precautions to obtain reliable results, it is true that such simulations will allow you to get a very significant glimpse at the overall results of very simple trading techniques across a wide variety of pairs in just a fraction of the time it would take you to carry out this same analysis using “every tick” simulations. Therefore – whenever it’s possible and adequate precautions can be taken into account – it is much better to perform a first analysis of a trading technique using the control points methodology, which is much faster, efficient and accurate (when adequate precautions are taken).